The leadership of Djak Tô district want to demolish dozens of private premises used for prayers and functions. The area lacks churches and in the past, people would travel up to 100 km to attend mass. Faithful turn to the bishop, who responds with a letter. While calling for calm, the prelate recalls the right to religious freedom recognized by the government. Hanoi (AsiaNews) - The communist authorities of Djak Tô district - Diocese of Kontum, in the province of the same name located in the Central Highlands of Vietnam – are threatening to tear down 22 Catholic chapels and places of prayer, because they do not have building permits or permits to be used for worship. The faithful, who fear to see their chapels destroyed in an area that has no churches and prayer centers, have turned to the bishop to stop the demolition and ensure respect for religious freedom. In response, the prelate wrote a letter to parishioners, asking them to continue in the faith, but at the same time, to seek a way of dialogue and reconciliation with the local administration. On 30 January, the president of Djak Tô district published a document ordering the demolition of 22 chapels belonging to the Catholic minority. On February 4, the vice-president sent a letter to local officials ordering them to proceed with the demolition. At the same time, Catholics will be prohibited from using their homes as a place of worship or for "religious purposes". To date, the buildings have not been demolished, but local sources report that (in the next few days) the provision will be enforceable. Meanwhile the authorities have strengthened surveillance, to prevent houses being used for prayer, Bible reading or ordinary pastoral activities. The faithful, who fear of losing these meeting places, have turned to the bishop of Kontum Msgr. Michael Hoàng Đức Oanh who, in response, wrote them a letter inviting them to remain calm, but steadfast in their faith. The prelate urges them to address the problem wisely and not exasperate sentiments, while defending the absolute principle "of religious freedom, which is recognized by the Church in Vietnam." He also promises he will liaise with the local authorities, to help them “better understand the issue”. The bishop notes that families have every right to "practice religious activity" in their homes, a right recognized and guaranteed by the laws of the country and this "should be patiently explained " to local administrators. The prelate concludes by reminding Catholics that, in joy and in sorrow, what matters is "to recognize the presence of God" and "the light of faith, living the mission as disciples of Jesus Christ." 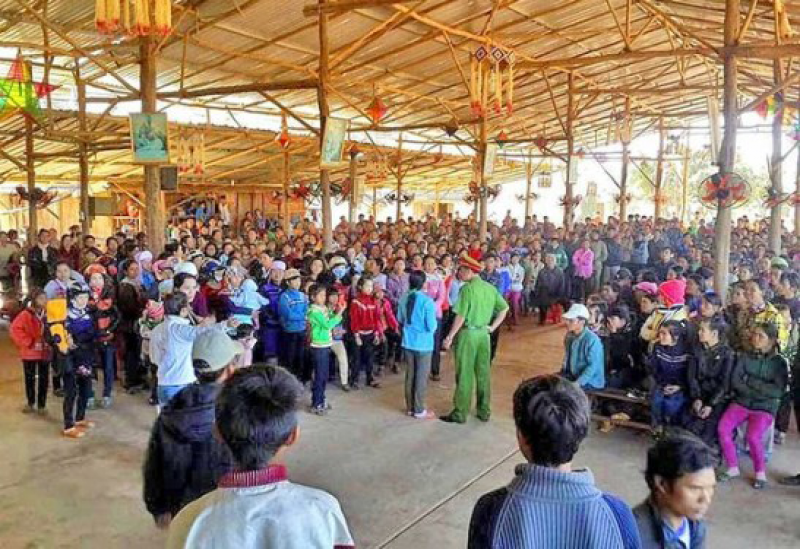 The diocese of Kontum in the Central Highlands of Vietnam, was erected in 1884 and is now composed of about 250 thousand faithful out of a total of 1.2 million inhabitants, half of whom belong to ethnic minorities. The Catholics from the area of ​​ Djak Tô district, for 30 years (from 1975, with the rise to power of the communist North, until 2005) were forced to travel up to 100 km on foot to hear Mass and receive the sacraments. Recently, authorities agreed to allow some priests in the area, even if the number of places of worship - churches and prayer chapels - are insufficient to meet the demands of the Catholic community. At least three districts - Đăc Tô, Tu Nơ Rông aqnd ĐăkGlei, home to 51 thousand Catholics out of a total of 142 thousand people – have been given permission by the Communist two build two "official churches". Authorities have refused the request of the parishioners for other places of worship. Hence, the need for "clandestine" churches and prayer houses which local officials now want to block or demolish.